Sundays without Michael can be long. 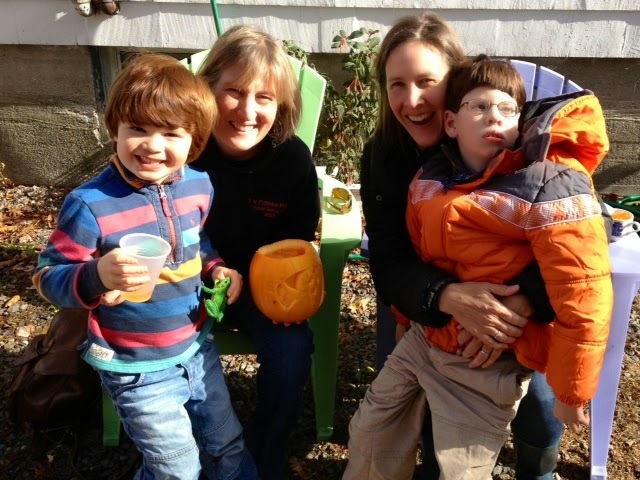 Yesterday could have been one of those days if not for Calvin’s willingness to walk the neighborhood sidewalks, if not for his hour-long nap and for the annual Pumpkin Sunday my friend Lauren hosted in her yard. We arrived late, her neighbors and friends already seated around the picnic table well into carving their orange gourds. Lauren immediately offered to take Calvin off of my hands so I could partake of her homemade pumpkin soup and caramel corn. While sipping the savory bisque from a mug I got to talking with one of the other guests, a nice woman perhaps Lauren’s age. I asked her how she knew our host, where she lived, what she spent her time doing and if she had any children. She told me about her daughter and young grandchild who, she explained, since they live nearby she spends a lot of time with. “It’s so important,” she said emphatically, drawing out the "o" in "so." I silently winced, knowing I will never feel the joy of having grandchildren, then I quickly changed the subject. With one eye on Calvin and his new steward, I watched as Lauren struggled to maneuver my impatient, uncoordinated, unbalanced boy, and was pleased, though not surprised, to see her manage him with such grace. The visit was short. I relieved Lauren and took Calvin into the kitchen to snag some soup-to-go from the pot on the stove. As we descended the back-deck stairs a white-haired gentleman held out his hand for Calvin to take, assisting my son down each step. At that moment I regretted having to leave, wished I’d had a chance to visit with the man, perhaps give him a hug in return for his kind gesture. I wondered if I'd see him again and if I'd remember his face. After loading Calvin into the car where he sat patiently, knowing we were headed home, my friend Tahnthawan, her husband Mark and their redheaded boy Oscar, who's half Calvin's age, came to send us off. My belly pressed against Tahnthawan’s pregnant one, a January baby on the way, as we hugged goodbye. Oscar squeezed inside the open car door to talk to Calvin, and I noticed Calvin turn to regard him, something in years past he’d never have done. Oscar wasn’t shy and told Calvin about the scary house he’d been to the night before, showed him his freshly carved pumpkin then sweetly waved goodbye. It was the kind of interaction I'd seen no more than a handful of times before and, for its sheer rarity and warmth, it meant the world to me. Before we’d left, Tahnthawan had made a snapshot with her phone. The photo is telling, and I’ll cherish it for the memory of its abundant kindness and love. What a lovely day. You are so right, Calvin is such a handsome boy. I love him in orange :) Hope you continue to have some good days.